Roland is a digital piano manufacturer that is known for making high quality digital pianos—from popular instruments like the Roland F-140R to stage pianos such as the Roland VR-730 or Roland RD2000. But Roland of course makes high end digital pianos too, and not many come more high end than the Roland LX-17. 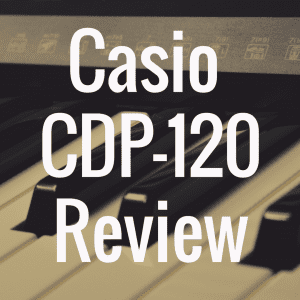 And in this article, we’re going to dive deep into the LX-17, helping you better understand what this upright digital piano has to offer, how close does it really sound to an acoustic piano, and if it’s worth the large price tag. And, to better help you make a decision, please compare the Roland LX-17 to other notable digital pianos on the market (made by Roland and other manufacturers, as well). Now the Roland LX-17 comes with a PHA 50 keyboard. What you get here are wooden keys, just like you’d find on a traditional piano. But remember, this is still a digital piano, which means that the LX-17 is going to give you the best of both worlds when it comes to its keyboard. Because on a traditional piano, keys made of just wood require maintenance. But on the LX-17, Roland has found a way to combine wood strength with plastic. And what you get, essentially, is a keyboard that’s more of a hybrid, of sorts. In short, you get the solid, rigid response you desire with wood keys, while the molded plastic material helps ensure that your keys don’t wear down over time as they might on an acoustic piano. And while a “realistic sound” is a somewhat relative term, you can take comfort in knowing that Roland has done a very good job in capturing the genuine sound and behavior of a grand piano inside of the LX-17. Now first, Roland uses modeling technology to give pianists a more realistic sound, and one of the benefits of this is that you get limitless polyphony. On less expensive digital pianos, pianists are often limited to a maximum polyphony that’s indicated in the instruments’ given spec sheet. If a piano only has a maximum of 128 notes of polyphony, that means that you can only play 128 notes at one time. The less polyphony your piano has, the faster your notes will decay, causing the piano to sound a bit flat when playing your music. This may or may not be a big deal to you depending on where you are in your piano playing experience. However, if you’re someone that’s considering the LX-17, there’s a chance that you either are currently playing more complex music pieces, or aspire to do that in the future. If so, it’s kind of hard not to get excited about the limitless possibility of maximum polyphony with this digital piano. With that said, to be technically accurate, I should probably point out here that you have limitless polyphony if you’re using piano category tones. If you’re using anything else, the polyphony count is technically 384. When playing the LX-17, you can hear the interference and resonance of the notes, just like you can when you play a traditional piano. On top of that, let’s talk a little about the actual sounds you get. 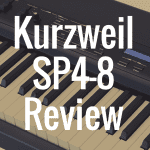 Here, you get four great piano sounds: Concert Piano, Ballad Piano (which is going to sound softer, colorful, and warm—great for expression or trying to invoke a sentimental sound). You also get a Mellow Piano (a nice warm, European sound) and a Bright Piano sound. There are over 300 sounds in total, so you really get a lot to play around with. I’d be remiss if I didn’t touch on the speakers in the LX-17, as well. Roland uses an acoustic projection speaker system to provide immersive sound. You get 8 speakers in total here. Six of the speakers will be on top of the instrument, and two 25 cm speakers are located on the bottom. What’s also quite nice is that, since the LX-17 is a bluetooth instrument, you can stream audio straight from your phone or iPad directly to the LX-17. And while some people might think this is great for listening to music on Spotify or Apple Music, I think it’s particularly helpful if you want to play a YouTube piano lesson or demonstration. Here, you can place your phone or iPad on the music rest, connect the phone or iPad via Bluetooth to your LX-17, and stream the entire lesson or demonstration from your device through the LX-17’s speaker system. So earlier, I discussed how the Roland LX-17 gives you limitless polyphony, which can in turn provide you with a ton of flexibility when it comes to the different musical pieces you want to play. But that’s not exactly where the flexibility ends. In fact, with the LX-17, you have the flexibility to go in and individually change the sound of each note. 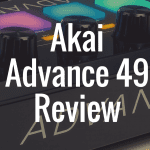 What that means is, you can now go in and change the tonal character of a given note, or alter the volume of a given note, and overall tune it to your heart’s content. In fact, you can also use the LX-17 with an app called Piano Designer, which really lets you control a wide variety of elements on this piano. So let’s briefly discuss this app, and how to use it with the LX-17, in the next section. So while an acoustic piano is a traditional instrument that requires maintenance to retain its quality, there are lots of little charming sounds and overall quirks that veteran pianists love about playing on an acoustic. And while digital pianos provide us with countless options, some people would love to have the technology of a digital piano combined with the sounds and overall tuning ability you get when using an acoustic piano. Fortunately, Roland has developed an app to suit this exact desire. In the Piano Designer app, which you can use with both Apple and Android devices, you can essentially tweak your digital piano like you would a traditional instrument. And, as you tweak a wide variety of settings on the app, you’ll likely begin to notice that your digital piano will begin sounding and feeling more like an acoustic piano—if that’s indeed what you’re looking for. So for example, if you download the app and open it up and connect it to your LX-17, you’ll notice that you’ll be able to tweak things like Hammer Noise. If you turn the noise up, you’ll notice the sound becomes brighter or bolder when you hit the key—very much like how it would react on an acoustic piano if a hammer hit a string very hard. Again, on an acoustic piano, you’d have to hire a technician to come over and tune your piano to get this same result. On the Piano Designer app, in conjunction with your LX-17, it’s just a matter of sliding your finger to the left or right on the adjustment setting. Another thing you can adjust is, for example, damper noise and resonance. On an acoustic piano, when you hit the sustain pedal, there is of course a little noise that can be heard when the dampers lift off the strings. And when you release the pedal, you can hear a little bit of noise when the dampers go back down. Well, just like when you listen to a CD, you don’t get the little pops and clicks in the music that you’d hear if you were spinning a vinyl record, you also don’t hear certain sounds like damper noise on a digital piano. But with the Piano Designer app, you can adjust this exact setting to allow you to actually hear the sound of damper noise come through your LX-17 speakers at the appropriate time (meaning, when you hit and release the sustain pedal). It should be noted, too, that this app doesn’t just work with the LX-17. It works with Roland pianos in the LX line, GP, and HP lines, as well. Like many digital pianos these days, the LX-17 comes bluetooth ready. This means that you can connect to your phone or tablet via wirelessly via Bluetooth. This has a particularly awesome advantage when it comes to reading music, because now, you can have a music score on your iPad. And by just pressing the center pedal, the score on the screen will automatically flip to the next page. In fact, the PiaScore app works really well for interactivity such as this. PiaScore, which is a very good app for browsing and interacting with digital music scores, also allows you to draw onto the screen to make key notes or points of emphasis. In many ways, the Roland LX-17 and Yamaha CLP-585 are, on the surface, similar digital pianos. Both use modeling technology, and both use wood keys in an effort to provide the pianist with a realistic playing experience. One notable difference is the polyphony count. While we mentioned earlier that the LX-17 doesn’t truly have a maximum limit when it comes to polyphony, the CLP-685 tops off at 256 notes of polyphony. The Kawai CS11 boasts that it features the longest keys and the longest pivot length of any digital piano. The Grand Feel II keyboard on the CS11 not only features wooden keys, but its long pivot length attempts to match the length you’d find in a Kawai grand piano. 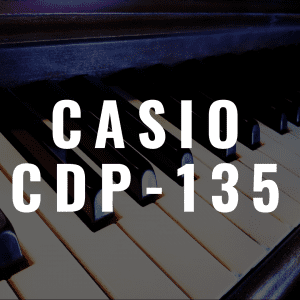 This can be particularly helpful when you’re playing more complicated musical pieces or complicated chords, as you now have more balanced key touch weight on the Kawai CS11. And, just like the Roland LX-17’s ability to tweak the character of the piano to make it feel more like an acoustic instrument, you can do the same with the Kawai CS11. Here, just download the Virtual Technician app, and you’ll be able to tweak your CS11 so much, people around you will wonder if you’re a professional concert tuner. 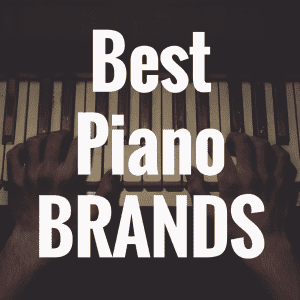 It’s a bit of a toss up between these two pianos—you likely can’t go wrong with whichever one you select. 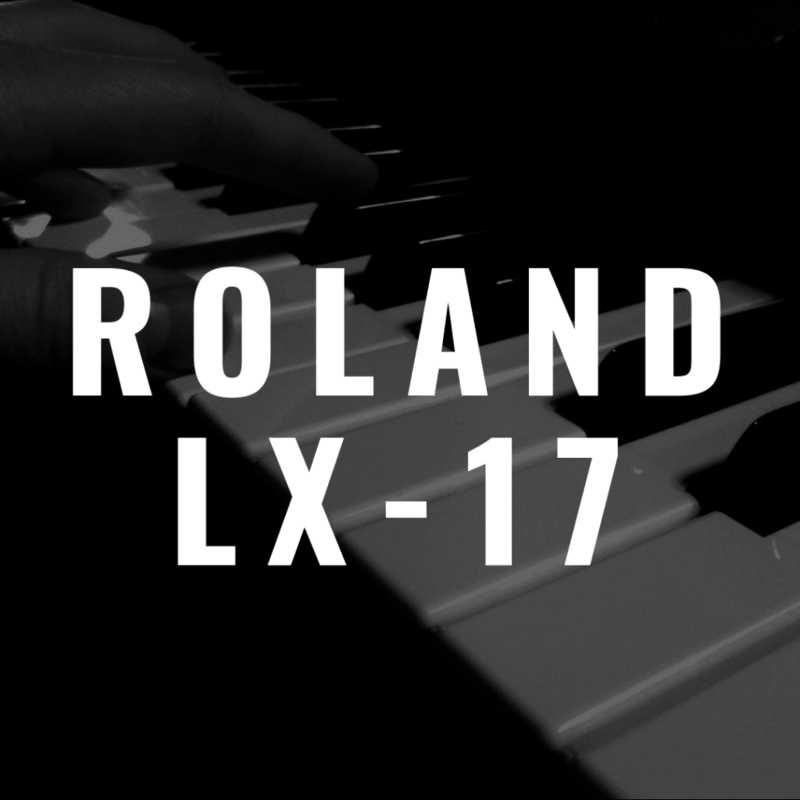 The Roland LX-17 is a wonderful digital piano that offers pianists great sound, technology, and flexibility. Despite costing about $4,000, this is a digital piano that’s a great investment if you plan to practice and play it for many years to come. Korg Grandstage review: Best Digital Stage Piano? 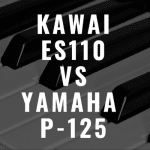 Kawai ES110 vs Yamaha P-125: Which is Best for Me?